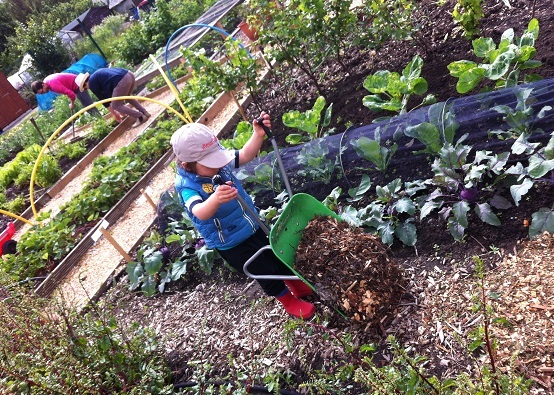 Continuing our seed saving stories, Incredible Edible Conwy share their experiences of supporting bees, sharing seeds and increasing their plot yield. The Charter Honey Fair comes to pass on the 13th of September every year in Conwy. It’s organised, quite rightly, by a local bee keeper who raises funds from the event for the Bees for Development charity. 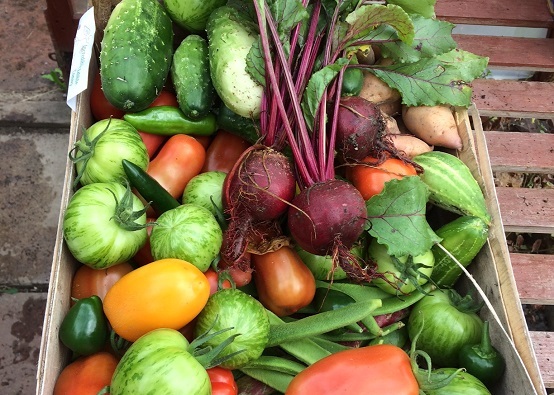 Incredible Edible Conwy never misses an opportunity to show their faces at an event in their home town. To keep the bee theme we collected seeds from pollinator flowers we had grown throughout the season, packaged them up with our details on the label and handed them out to the public as a giveaway. The pollinator seed packs included marigolds, sunflowers, sweet peas, poppies, foxgloves, hollyhocks and corncockles. 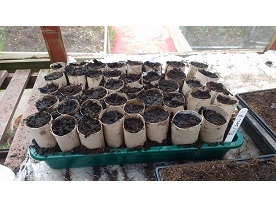 The seeds were collected and dried out in the greenhouse before being packaged up in envelopes. 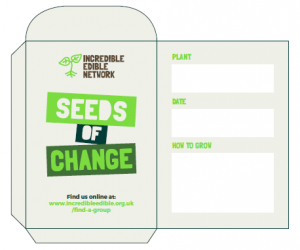 Use the great Incredible Edible seed packet to help promote your group at the same time – you can download the template here (sign up required). Why did we do it? Because once planted and grown these nectar rich flowers provide food for the bees and when they are grown next to crops, they encourage crop pollination which helps with successful and fruitful yields. 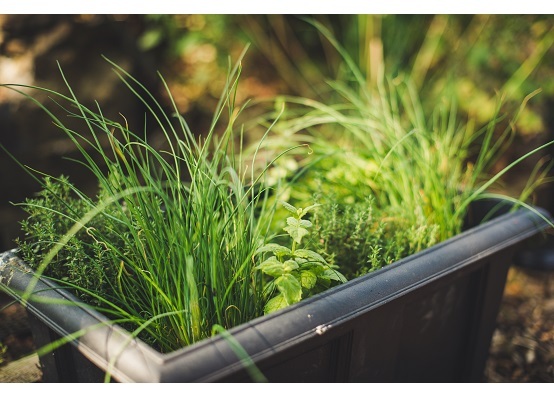 Good news for anybody growing edible plants! 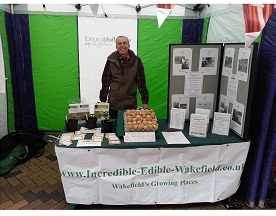 Our clever members had also laminated photos of the seeds flowers on the stall for identification. 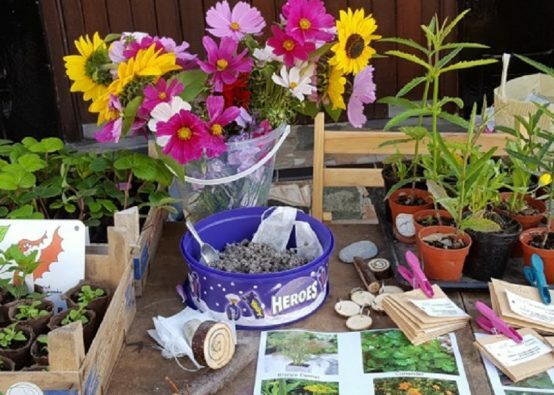 The giveaways didn’t stop there either; we had a whole caboodle of plant cuttings, vegetables, seedlings, cut flowers and handmade snails, mini bug hotels and bird feeders. Fairs and events are a great fund-raising opportunity for the group and although we never put a price on anything, we have a donation box at the ready and we are generally pleasantly surprised by the generosity of folks. 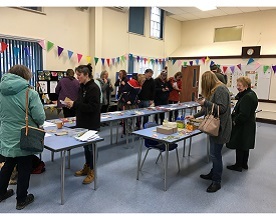 This is a great example of how an Incredible Edible group can get involved in community activities, raising their profile as well as generating a bit of income – living in connected communities has benefits for us all!